Built in 1903 as a former opera hall, this central Saint Andrews guest accommodation is just a half block from the boutique shops of Water Street. It features a spa, restaurant, and free Wi-Fi. 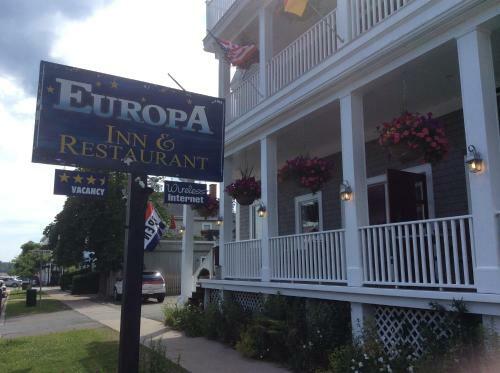 Europa Inn is a European- style Inn and sap with modern air conditioned rooms located in the heart of St Andrews-by-the-sea. Licensed dining room, lounge bar. Menu features Atlantic Canadian products prepared by German Master Chef and owner Marcus Ritter. Serve upscale fusion euro cuisine incorporating the fresh local products and seafoods of the Bay of Fundy. Visit us at http://www.europainn.com. Spend the perfect day- in beautiful St Andrews! New Christmas Tree this year! lots going on in beautiful St. Andrews! Annual Gift Sale Starts Today! Any of our recent guests miss this earring?